Datuk Dr Laurentius Ambu, Director of Sabah Wildlife Department giving the opening speech at WARN 2013. Professor Kurtis Pei, Interim Board Chair of WARN and professor at the National Pingtung University of Science and Technology, Taiwan. 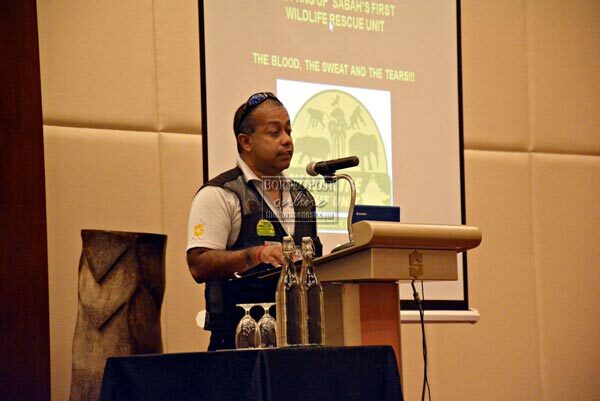 Dr Senthilvel Nathan, Assistant Director of Sabah Wildlife Department giving his presentation on the history of the Wildlife Rescue Unit at WARN 2013. Dr Benoit Goossens, Director of Danau Girang Field Centre and advisor to Sabah Wildlife Department chairing the wildlife trade/poaching session at WARN 2013. Illegal poachers in Malua BioBank (Picture courtesy from Sabah Wildlife Department/DGFC). 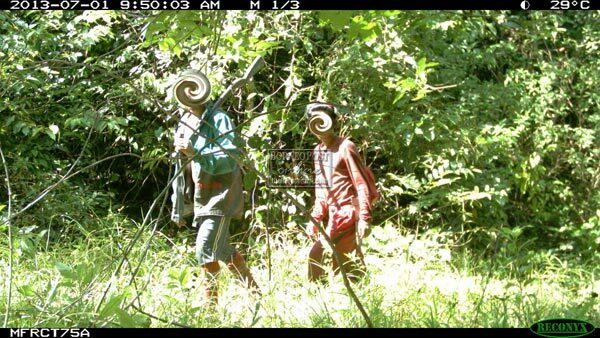 An illegal hunter with a backpack full of wild meat in Sipitang Forest Reserve (Picture courtesy from Sabah Wildlife Department/DGFC). 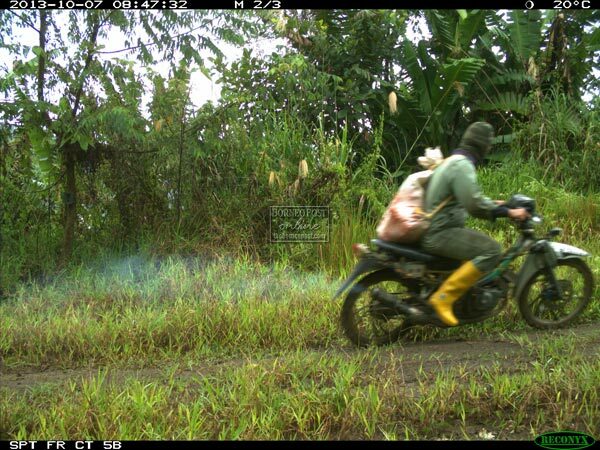 An illegal hunter spotted in Sipitang Forest Reserve (Picture courtesy from Sabah Wildlife Department/DGFC). 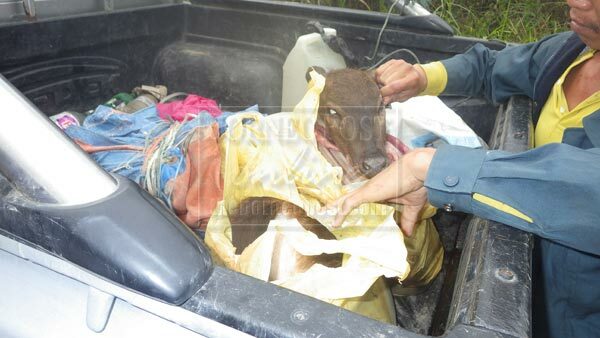 A dead sambar deer in the back of a pick-up truck in Sipitang Forest Reserve, hunted by a group of six armed hunters from Kota Kinabalu on a camping trip (Picture courtesy from DGFC). 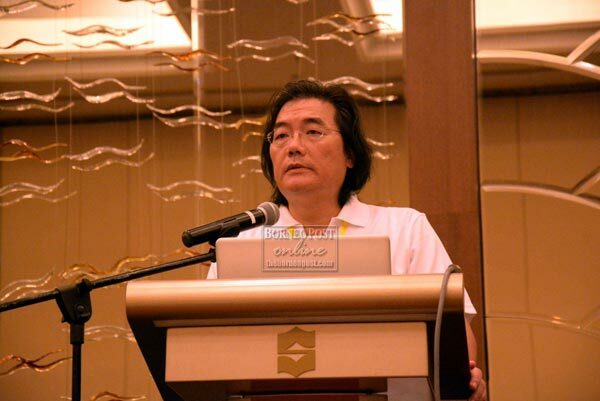 KOTA KINABALU: Numerous shops in Sabah were found selling bear products, which show wildlife poaching is rampant in the state, the 5th East and Southeast Asian Wild Animal Rescue Network (WARN) Conference was told. “I’m very proud to say that WARN was established as a registered international NGO since August 2013 and that we have members in the following countries: Cambodia, China, Hong Kong, Indonesia, Laos, Malaysia, the Philippines, Singapore, South Korea, Taiwan, Thailand and Vietnam, and many representatives from wildlife rescue centers in those countries attended WARN 2013 in Sabah,” added Professor Pei. “The purpose of WARN is to enhance the capabilities of East and Southeast Asian wildlife rescue centres to rescue and conserve wildlife, provide conservation awareness education for the public and advocate minimum standards for wildlife rescue centres,” concluded Professor Pei. “WARN 2013 was a great opportunity to showcase our very own Wildlife Rescue Unit that was set up three years ago, a team of local boys and girls working tirelessly to save and protect wildlife in Sabah,” said Dr Sen Nathan, Assistant Director at SWD, and head of the Wildlife Rescue Unit. 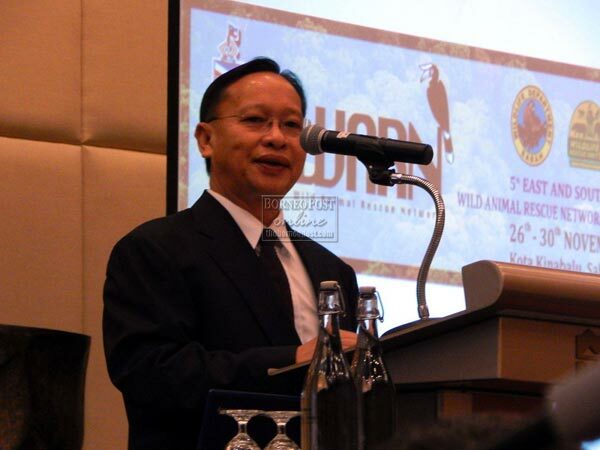 “Sabah sees the potential of WARN as an organisation that would be able to bridge all Asian countries together in terms of wildlife conservation matters and also assist government authorities in respective countries monitoring illegal wildlife trade,” added Nathan. “SWD is actually looking at setting up a Wildlife Enforcement Unit, working in a similar way to the Wildlife Rescue Unit, but focusing on wildlife trade, illegal hunting and bushmeat trade, using the best existing tools against wildlife smuggling and poaching and having a permanent presence in all protected areas in Sabah. We are currently looking for institutions interested to support this unit,” said Datuk Dr Laurentius Ambu, Director of SWD. “We might seem to have lost many battles, but I can assure you, the buck stops here and the war for wildlife conservation is being fought hard by a very dedicated group of people here in Sabah in whom I give all my trust to be successful in tackling the problems caused by wildlife trade and illegal hunting in our protected areas. This has to stop and we will use every means to end it,” said Datuk Seri Panglima Masidi Manjun, Minister of Tourism, Culture and Environment when opening the WARN conference.